Even if a brand is trying hard to express his core values and identity through a logo , there will be always another side that we see, as a customer, based on our experiences and visions. I tried to „undress“ some famous brands in this personal project made just for fun. I hope you will appreciate not only my Photoshop skills. myHOTJuly hat einen guten Namen. Ich assoziiere damit Sommerwetter, Blondinen und Bikinis. Aber darum geht’s hier nicht. Sie verändert Markenzeichen. So, wie sie wohl vom Konsumenten wahrgenommen werden. 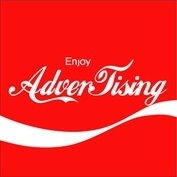 Mir gefällt „Enjoy Advertising“ am besten. Sollte klar sein.